Submitted by Rob H (not verified) on June 8, 2006 - 5:39am. I swear by the Art of Shave line of products for my shaving. I have a thick beard that grows back very quickly after about a couple of days and the Art of Shaving products are priceless. I use a Mach 3 Turbos as my razor of choice..It gives a hands down close shave. I did try the Fusion (battery model) and the 5 blades I found to drag more against the skin than glide, so I swithced back to the trusty Mach 3, though the single blade on the back of the Fusion does come in handy for shaving hard to reach spots. Anyaway, my routine is to always shave after a hot steaming shower. Followed by Art of Shave Lemon Essential Pre-Shave Oil, makes for a comfortable shave. 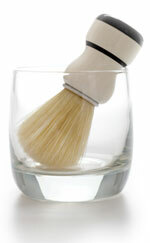 Then I lather up with a Badger shave brush with Art of Shave Lemon Essential Shaving Cream. After I'm done shaving, I wipe my face clean of any excess shave cream and splash my face with cool water to sooth and close the pores. Then I go over my faace with an Alum Stone to seal any nicks. And finally, I apply you guessed it Art of Shave Lemon Essential After Shave Balm to moisturize and sooth the skin again. I swear by the Art of Shave Products and are worth every penny, plus they have a great scent and don't irritate your skin.